Rather than continuing on a traditional technology development path, adopting new technologies – still in the research phase – could cut the emissions of direct greenhouse gases (GHGs) from aluminium production by 66% in 2050 and reduce the associated energy consumption by 21%. This is according to a new report from the European Joint Research Centre, which operates as the European Commission’s in-house science service, covering areas of research and development as well as outreach work and international cooperation. The report maintains that reductions between 2010 and 2050 for primary aluminium production could be even higher, amounting to 72% and 23% respectively. The findings stem from an analysis of the current status of the aluminium industry in EU28 and Iceland, which quantifies the potential for GHG emission reduction and energy efficiency. The current EU target for 2030 of reducing GHG emissions by at least 40% below 1990 levels will support the long-term objective of cutting emissions by 80-95% by 2050 in the context of necessary reductions by developed countries as a group. The work carried out for this report supports the European Commission’s 2015 Energy Union package, which – among other activities – highlights the need for additional research priorities such as carbon capture and storage (CCS) and inert anode technology used in the aluminium production process to reach the 2050 climate objectives in a cost-effective way. The European aluminium industry has made substantial efforts to improve its performance in terms of energy efficiency and GHG emissions. However, to achieve the ambitious EU targets, further improvements are required, the report claims. JRC scientists compiled data on existing aluminium production facilities and their production characteristics as well as the best available and promising innovative production technologies. The latter involve the use of dynamic AC magnetic fields, wetted drained cathodes, inert anodes or carbon capture and storage (CCS). The model used identifies cost-effective improvements in aluminium production at facility level and the impact of their implementation on energy consumption and GHG emissions. This is based on the condition that investments are recovered within five years and on the assumption that there are no barriers for the timely commercialisation of the identified technological solutions. The analysis shows that most of the resulting reductions are realised by technologies that are in early stages of research, such as inert anodes that are at a technology readiness level (TRL) of 4 or 5, or CCS at an even lower level. Therefore, harnessing this potential requires effective policy push to create the right conditions to allow the further development and commercialisation of these innovative technologies. 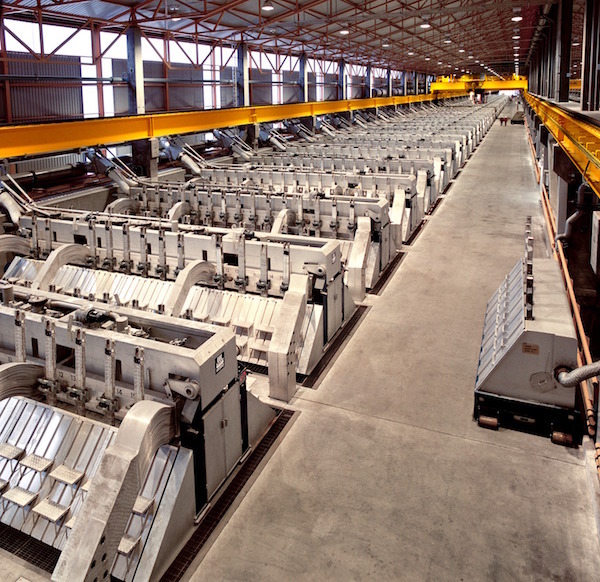 Primary aluminium production is an energy intensive process – it requires approximately 37 GJ of thermal energy and 58 GJ of electricity per tonne of sawn aluminium ingot produced. 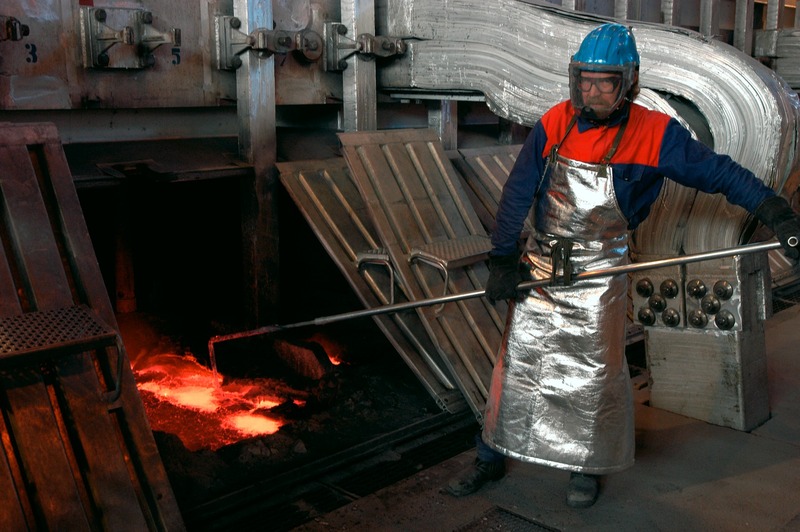 This thermal energy consumption is around twice the required per tonne of steel produced from the integrated route – blast furnace and basic oxygen furnace – and the electricity consumption is more than ten times the required per tonne of steel produced by the recycling route using electric arc furnaces. The overall direct CO₂ equivalent emissions from the process amount to around 3.5 million t of CO₂ per tonne of sawn aluminium ingot. If the average CO₂ associated with the generation of the electricity used is calculated, this would add additional 7.4 million t of CO2 per tonne of aluminium ingot. Secondary aluminium production requires as little as 5 % of the energy needed for primary aluminium production. The total indigenous production of the European aluminium industry in 2013 was around 8.9 million t, excluding imported ingots (3.3 million t ) and re-melted metal (6.1 million t ). Primary aluminium makes up around 4.2 million t of this total output while recycling contributes some 4.7 million t .
Aluminium production produces a quantity of fluoride waste: perfluorcarbons and hydrogen fluoride as gases, and sodium and aluminium fluorides and unused cryolite as particulates. These levels can be down to 0.5kg/t of aluminium in the most efficient modern plants built in the past 10 years say, but up to 4kg/t of aluminium in older plants built in the ’70s. Unless carefully controlled, hydrogen fluorides are very toxic to vegetation around the plants. Perfluorcarbon gases have a strong greenhouse effect and have a long lifetime. In the Soderberg process, an anthracite/pitch mix is baked to form continuous anodes and this generates significant emissions of polycyclic aromatic hydrocarbons as the pitch is consumed in the smelter cells. The pot linings end up contaminated with cyanide-forming materials – although for example, Alcoa has a process for converting spent linings into aluminium fluoride for reuse, and synthetic sand usable for building purposes and inert waste. Ken Stanford gained a B.Met. in Metallurgy and Materials Science from the University of Sheffield and an M.Sc. In Science & Technology Policy from the University of Manchester, UK. Formerly Group Managing Editor and Technical Director at DMG World Media in the UK, responsible for editorial in publications including Aluminium International Today, and also the ALUMINIUM series of events, including in Germany and the USA. 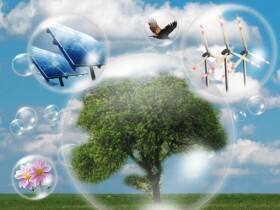 Particular industry interests centre on sustainability and environmental issues, new technologies, innovations and applications. This entry was posted in Technológia and tagged EU, Green technologies, innováció. Bookmark the permalink.